We understand your concerns regarding treated wood and the health and safety of our children. 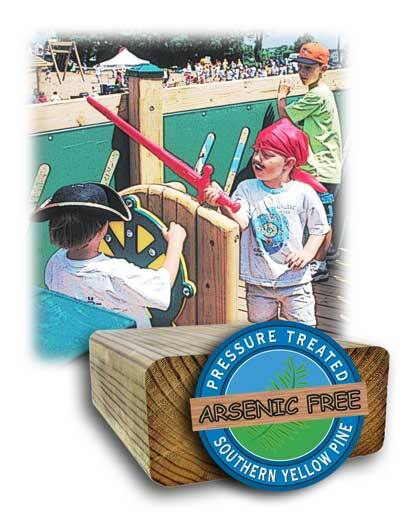 That’s why PlayWood Plus wooden playgrounds use wood protected with a micronized copper treatment—a 100% arsenic-free wood treatment that improves the longevity of your playground without compromising on safety. And while PlayWood Plus is unlike anything else on the market, you need not worry about its compliance with safety standards. PlayWood Plus wood playground products are designed to meet and exceed the most recent edition of ASTM F1487, CPSC and CAN/CSA-Z614 safety standards and can be designed to conform to ADA Accessibility Guidelines. These types of natural wood playgrounds have been built in the United States, Canada and overseas since the early 70s.